Mexico is a country full of natural beauty and wonder, and that is never more evident than when taking a look at their beaches. Below we break down out top 7 picks for most beautiful beaches in Mexico. Located about an hour south of Cancun, Tulum is known as one of Mexico’s most beloved destinations for a beach vacation. With white sand, warm, turquoise water, and jungle-lined roads, Tulum has everything you could want in a beach destination. Besides the beach, Tulum is famous for some of the best and most innovative food in the world. The appeal of this off-the-radar paradise comes from it’s seclusion. Yelapa is a 30-minute boat ride from Puerto Vallarta—and yes, you can only get there by boat. Visitors of Yelapa can enjoy a long beach with few tourists. Just steps from the shoreline you can grab some fish tacos and beer at the thatched-roof bar Angelina’s Gardens Beach Club, and spend the rest of the day swaying in one of the many hammocks strung up beneath the palms. Isla Mujeres is a destination is its own right, despite often being looked at as a side trip to Cancun. The main beach of Playa Norte is full of crushed coral and warm shallow waters. It is also much quieter and more isolated than the beaches across the bay. The island is home to the most whale sharks on the planet, so scuba divers should be aware. Playa del Amor (more commonly referred to as HiddenBeach) is a dream-like, albeit hard to reach, attraction located west of Puerto Vallarta. The beach is engulfed by a cave with a giant hole in the roof—a hole rumored to be the result of bombs from military testing by the Mexican government during the early 1900s. The hole now offers a unique skylight that opens the beach up for sunbathing, swimming, and enviable Instagrams. Five-mile-long Playa Los Cerritos is a popular spot for surfing (and lessons are easy to find) and shell collecting. Known to be one of the safest swimming spots near Todos Santos, it is a great beach destination for little ones. It is also one of the most developed beaches in the area. You can find a bar, a restaurant, and luxury boutique hotel Hacienda Cerritos, pictured above. Troncones, formerly a quite fishing village, has become an under-the-radar escape for travelers, especially those looking for adventure. The three-mile-long beach draws surfers from all over the world, plus tourists can enjoy horseback riding on the sand and hiking in the nearby Sierra Madre mountains. Best of all, with a population of around just 500-600 residents, Troncones maintains a wonderful sense of privacy and isolation. The Costa Alegre spans Mexico’s Pacific Coast, where luxury hotels dot wild landscapes. Just look at the two-mile-long shoreline of Playa Soledad, the private property of Las Alamandas resort. 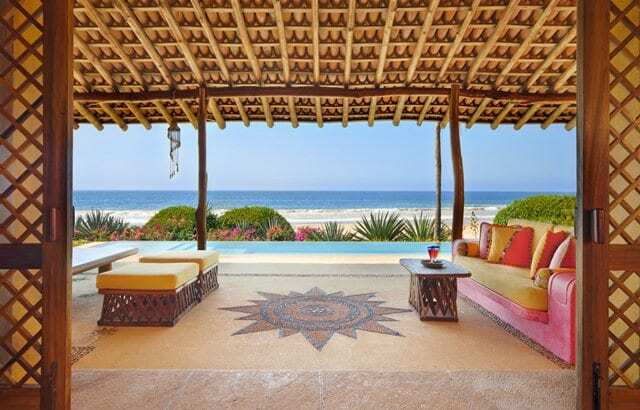 Or, consider a stay at Cuixmala, where a 25,000-acre wildlife preserve can be found in your backyard – literally! Call us today to book your own beach getaway at 402-281-3022.